Industry sources have informed ISPreview.co.uk that Openreach (BT) are to revise down their UK rollout plan for 330Mbps capable hybrid fibre G.fast broadband ISP technology from 10 million to nearly 6 million premises. The aim is to refocus on their new Gigabit capable Fibre-to-the-Premises (FTTP) deployment. Under the previous plan Openreach had aimed to push G.fast coverage to 10 million UK premises by 2020, while their “Fibre First” deployment would work to extend “full fibre” FTTP to 3 million premises within the same time period (plus they’re still working on an aspiration to reach 10 million premises with FTTP by around 2025 at a cost of c.£3-5bn). At the time the operator made it clear that FTTP and G.fast would be rolled out into different areas, although in practice this could be quite complicated to achieve (the limited coverage and variation in G.fast performance isn’t always easy to pin down). On top of that the Government, Ofcom and many others have been continually pushing FTTP for the future. Nevertheless BT Group recently reported that G.fast has so far covered 1,117,000 premises, while their FTTP rollout had reached 631,000 premises, but the latter seemed to be ramping up much more quickly. Meanwhile the G.fast deployment appeared to be going much more slowly than it should have been at this stage. “Full fibre’s our priority and we accelerated our investment plans to reflect that. Our engineers are already building FTTP to 10,000 premises each week and we’re on track to reach three million homes and businesses by the end of 2020. Our ambition is to reach 10 million by the mid-2020s. This is good news. Some logic has hit Openreach? I've never been a real advocate for G.fast. The deployment model that they decided to use was detrimental to having ultrafast coverage other than for perhaps up to ~60% premises. Of course, this figure would be subject to a reasonable amount of variation, though I imagine they were only ever going to deploy G.fast to higher density areas (where a good amount of premises should be able to receive ultrafast speeds of 100 Mbps or more). Anyway, this is coming from someone who has no experience with DSLAMs or network engineering, so a lot of this could be wrong. Perhaps it is completely uneconomical to consider, and perhaps because it has never really been publicly noted that there has been thought put into the potentiality of rolling it out then maybe no testing was ever done, and Openreach would need to spend perhaps the best part of a year testing it alongside existing hardware, etc. (which in that time they may as well just commit to G.fast and FTTP rollouts where appropriate). In reference to SuperVector, someone could do some reading here (http://support.huawei.com/enterprise/en/doc/EDOC1000137144) if they were interested. The above is not to say that I wouldn't like to have G.fast, because that's not true. I would benefit greatly from having it since I have a somewhat short loop. There is at least one cabinet which has a G.fast pod on, but it is not mine (which needs a re-shell) and this latest news may even mean that I won't get it despite showing as planned on the checker previously (before planned G.fast records were mass-removed). Though I shall cross my fingers and hope that it will come anyway. I've said from when they picked G.Fast that they should have gone with VDSL2 profile 35b. It would have increased speed and reach on FTTC for everyone, not just those very close to the cabinet. I suspect the ECI estate played a huge part in that decision though. The existing Huawei cabinets could have Vectoring deployed and be made to work with a Profile 35b rollout (even with other vendors) but the existing ECI DSLAM's would need replacing for this to happen. Yes I agree that perhaps ECI DSLAMs were part of the reason why they went down this path. There is a large ECI DSLAM footprint, especially from some of the initial commercial rollouts (around the time when ECI was favourable). This would lead to essentially what is known as a postcode lottery on whether you could exceed 100 Mbps on FTTC which I imagine they would want to avoid, even though a decent portion of people could benefit from it (probably more people than can benefit from G.fast to get ultrafast speeds with less effort and spending). But I guess they can't compete with the likes of Virgin Media and alt-nets in commercial rollout areas that have ECI without the ability to provide anything faster than 80 Mbps. In reference to compatibility with SuperVectoring, I can see that the MA5616 is listed in the Huawei docs, but not the MA5616T (the model mentioned on the Kitz site https://kitz.co.uk/adsl/fttc-cabinets.htm). Perhaps there is an error here? I can't see the MA5616T in the Huawei support at all under MDU (http://support.huawei.com/enterprise/en/category/access-network-pid-1482605784817), unless perhaps the "T" version is a minor revision. I don't know. Is installing new G.fast pods really that much less work than replacing ECI DSLAMs? Would the problem be that a concrete base for an ECI might not be big enough for one of the larger Huawei cabinets (thinking about more rural cabinets in verges, no so much ones on pavements)? I thought the biggest expense was getting the fibre optics and power to the FTTC cabinet, not so much the box of electronics on top. I think profile 35b would require replacing the line cards in the Huawei cabinets, and of course fitting a new vectoring engine. Somehow replacing almost the entire contents of a Huawei cabinet is perfectly fine, but replacing an ECI is a no go because it's an ECI and ECI are rubbish, indestructible, and Openreach have lost all the keys to get into them? A bit like not getting a new computer CPU because you'd need a new motherboard, or just getting a new CPU and motherboard. Or building a whole new computer and sitting it next to your existing one. Or building a whole new computer and sitting it next to your existing one. Yep, thats what I've done But the new one is my main PC now. I think a quite a lot of the ECI cab's round here now have Huawei twins. What I implied that was upgrading hardware in existing Huawei cabinets is probably cheaper and going to cover more premises with ultrafast than G.fast. I could be wrong, since I do not know what these upgrades will cost. I wasn't intending to imply replacing ECI cabinets with Huawei would be cheaper than G.fast, but the point still stands that SuperVectoring would provide more premises with ultrafast than G.fast if it were rolled out to cabinets. So what did the ECI cabinets have to do with the decision to go for G.fast then? Was the logic something like, it's a bit more work to replace the entire ECI cabinet with some other cabinet, so lets install new G.fast equipment instead, which would possibly be just as much work if not more? Also, does anyone really care about just barely scraping over the 100Mb ultrafast threshold? Openreach should have rolled out 100% Huawei cabinets and bring in SuperVectoring with VDSL2 profile 35b from 17a in the first place rather than G.Fast cos it can get 300/50 within 300m. I am amazed. But then I am also ignorant. What an embarrassing cockup about-turn. But sanity arrives belatedly and this is very very good news. If they ever were to put a green cab of some sort in Heasta it would be in the centre of the village and so I would be too far away from it, as the village is a long strip about 1200m long or something, and I am the northernmost house, so if it were still using copper then I would be relative knackered compared to others and especially G.fast would be a joke. Btw, would that ever happen in this future ? If BT were to put an entirely new node into a village that was all-EO lines only before, would it in future be FTTP since they need to do so much replacement anyway? Or is there still going to be a danger of future FTTC nodes in such situations? Perhaps I should beg some politician or other to do the right thing? Or perhaps forget the whole thing and suggest they spend the money on something important such as the NHS, old folks or whatever. Been better to have gone for 35 profile than G Fast. ejs, it was just speculation on my part. I would take anything I say in reference to economic viability with a pinch of salt since I do not know the true costs nor reasoning behind the choice of a large company. I imagine G.fast hardware alone is expensive, but surely the work associated with replacing a cabinet and its hardware would take more man hours, scheduled works (pathways/near roads) and more materials? And you've got distruption for the EUs from replacing the cabinet. But I imagine existing nodes may compatible with new VDSL hardware, so that's one less issue (but a node upgrade may be necessary to prevent severe contention). But what should be asked is that perhaps due to the way telecommunications work in the UK, Openreach probably want to be careful not to create too many diverse mainstream products that ISPs need invest in? All this ignores the technologicial limitation of 96 ports perhaps being the maximum for G.fast in the foreseeable future (as I imagine vectoring is a huge challenge with such bandwidth at a high density). That's bearing in mind that the technology was intended to be used at distribution points since each line card supports 24 ports and I believe the current maximum is 2 line cards (48 ports), though there are not many cases where DPs exceed those amounts (but sadly, this is not the deployment case). I do not know what the density for SuperVectoring is, so I cannot comment about that (but I was under the impression it was less than standard VDSL2). But putting future G.fast against current maximum FTTC densities per DSLAM (96 vs 384 possible subscribers) and if we say there are exactly 384 lines under a typical distance scenario then even though up to ~240 should be short enough for G.fast (100 Mbps minimum) then only ~40% of those close enough (25% of total lines) could benefit from it at the same time (but of course this assumes demand). It's a good question to ask whether anybody cares about just scraping 100 Mbps (which is the current ultrafast threshold). It's a numbers game. Thresholds and limitations deciding what technologies can be labelled as. I just understand that the connection will go as fast as it can based on many variables. But the threshold impacts what the technology can be sold as and who it is available to. 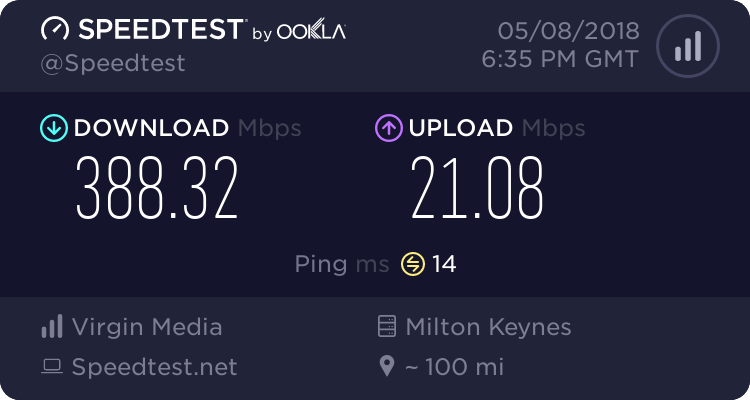 Just like how BT couldn't sell their superfast products to those below the 24 Mbps threshold - it had to be a seperate product, even though it was still FTTC. So what did the ECI cabinets have to do with the decision to go for G.fast then?